What a strange and melancholy ritual the farewell broadcast is. Stranger still is how familiar we’ve become with it: The gathering of old friends, the acknowledgment of the staff, the solo dive into emotion, some raucous music to chase away the tears. The rolling of credits that will never be unrolled. After a decade-plus of relative talk-show stability, change has come to late night in a great, generational gust, sweeping out the old hosts and ushering in a new, uncertain era. First Leno fell, then his replacement, Conan. Then Leno left again — this time presumably for good. Colbert took flight, and Ferguson signed off. And, just two months ago, David Letterman — the Ahab of 11:30 — steered his cranky ship toward the broad horizon of retirement. The rough breeze blew through Manhattan again last night, unseating a man who never seemed eager to become an éminence grise but ended up as one anyway. After 2,000-plus episodes — and considerably more bleeped profanities — Jon Stewart hosted his final Daily Show. He did so in a way that felt consistent with his public persona and personal values. And that it was as funny and profane as it was moving goes without saying. 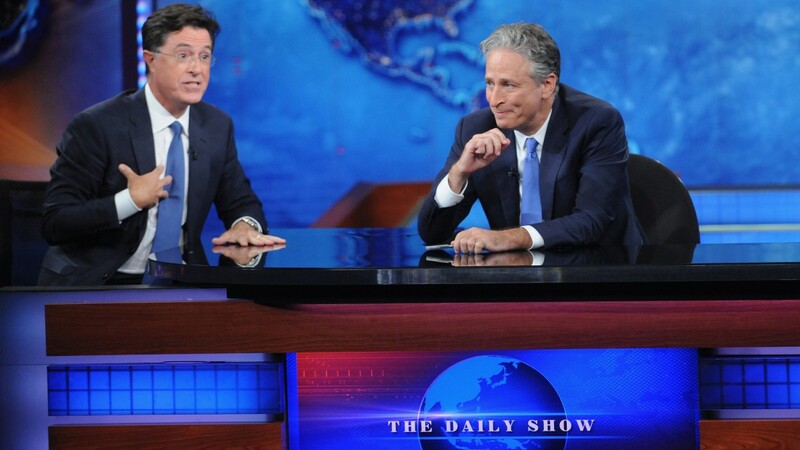 But this ought to be shouted: Jon Stewart’s farewell was the best I’ve ever seen given by an adored television figure. The tone, throughout, was perfect. The nearly hour-long broadcast never felt somber like a funeral (“yet we all still remain alive,” Stewart said, pluckily, when the studio audience began to wail), nor bittersweet like a retirement party. Unlike Carson’s classy last toast, Leno’s sheet-cake-in-the-break-room goodbye, or Letterman’s fatalistic shrug, Stewart used his last show to underline, not eulogize. His final moments behind a desk were spent in service to and celebration of the core values that had been beneath every Bush-ian giggle and Arby’s-baiting gag. If Stewart hated hearing these kind assessments of himself, he certainly demonstrated why he earned them — especially last night. With the schtick retired and the media he so often mocked focused directly on him — I walked past the Daily Show studio on the West Side yesterday afternoon and was tickled to see a CNN truck parked importantly out front — the only history left for Stewart to comment on was his own. The pull quotes will all come from the cutting and clever editorial in the third act, and perhaps they should. (How many hosts can turn a tenure-ending summation into a forward-looking mission statement? Will Jimmy Fallon sign off in 14 years by reminding people that you don’t always need to use two hands when drinking beer in an inflatable fat suit?) This wasn’t a moment of Zen, it was a call to action and all the better for it. But to me, Stewart’s generosity was spread evenly throughout the broadcast. It was there in the opening moments, when he modestly (if facetiously) spoke of an “obligation to devote the entirety” of the last show to “full-team coverage.” And it was there throughout that dazzling first act, in which nearly every Daily Show alum, from Oscar nominee to recent trending topic, returned to share a joke and a boisterous hug with a beloved boss — a boss who, it should be noted, always stayed seated and thus refrained from stepping on their punch lines or stealing their spotlight. It shone brightest during the lovely Goodfellas parody that turned everyone on the staff, from secretaries to security guards, into stars. And it pulsated through to the end, too, when Bruce Springsteen — another skilled practitioner of the uncanny blend of performance and sincerity that seems to emerge only from New Jersey — took the stage. The song he and the E Street Band performed, “Land of Hope and Dreams,” was never a hit, but it hit hard last night; its patriotic glorification of saints and sinners a fitting coda for a show that created a community of laughter during a time when the country often felt as if it were breaking further and further apart. For a finale, the episode was surprisingly joyful. Part of that has to do with the fact that Stewart isn’t being pushed out by anyone but himself. Leaving was entirely his choice, and considering the good judgment he’s shown over the years — killing Crossfire, refusing to make Death to Smoochy 2 — even heartbroken fans seem to trust him with it. Rather than toil on, Stewart can walk away, secure in the knowledge that his legacy is tied to a very specific, and often very odd, period of American life. His first show began with a Monica Lewinsky joke; his last week was filmed in the shadow of Donald Trump’s hair. But between those cartoons, there was plenty of catastrophe. For people of my generation, who grew up in the relatively staid ’80s and ’90s, Stewart was an essential shepherd for the post-9/11 world, one in which the unthinkable suddenly became the unavoidable. And though Stewart himself trends toward Luddism — the way he pronounced “Drizzy” was charming proof of that — his strident disruption of generations of top-down journalism presaged and shaped the Internet age. That his own show had fallen victim to the same sort of echo-chamber choir preaching that now defines much of the web was unfortunate, but perhaps inevitable — and the one reason Comedy Central isn’t 100 percent distraught that Stewart chose to cede his chair to a younger, potentially savvier voice. About that. I was surprised yesterday to read some pre-obituaries of The Daily Show With Jon Stewart that claimed his show had succeeded in part due to the anger of its host — and how that anger had been in perfect harmony with a furious era now passed. (See above, about Fallon and fat suits.) I couldn’t disagree more. Yes, Stewart could be cranky, dyspeptic, shocked, or even, on occasion, legitimately appalled. But any psychologist can tell you that anger, even in its mildest forms, is essentially another expression of love. We rage only about things that matter to us, deeply and personally. If anything, Stewart’s primary emotion was intelligent exasperation — the type born out of unkillable optimism. That’s why his questions remained as strident as ever, despite the passage of time and the utter lack of satisfying answers. Why couldn’t bankers and politicians be honest? Why shouldn’t the media be responsible? I’m not sure Stewart was ever truly mad as hell, but beginning sometime around the 2000 election, he damn sure wasn’t going to take it anymore. The satire that erupted out of that moment wasn’t just hot air and fury. It was active and considered. It gave shape to a pervasive feeling of frustration and impotence and it gave voice to those who felt silenced or ignored. Watching yet another genius clip of Stewart “eviscerating” a hypocritical target was as much palliative as it was provocative. By the way, do you know who has been the most vocal supporter of this transition? Jon Stewart himself. It was he who beat the drum all spring for Noah to be his successor and it was Stewart who yielded a few precious seconds of his remaining screen time last night to let the young comic shine. For a host whose reign was defined by self-awareness and generosity, knowing when and how to say goodbye was the logical next step. Jon Stewart will be back on TV in some form and likely sooner than any of us expect — as he put it, his version of the show is ending but the conversation of his career carries on. And so, too, will The Daily Show. Last night was a reminder that it was Stewart’s off-camera skills as a human being that informed his brilliance as a broadcaster. He earned the devotion of his colleagues and audience the same way: by providing a nightly model for the decency and professionalism so rarely found in Washington. One of the most important aspects of any job — though one oft ignored by those lucky enough to snag a tenured position on our televisions or in our Congress — is making sure that others can do it after you, and do it well. There was no banner in the Daily Show studio last night proclaiming “Mission Accomplished.” But it was true, just the same. It’s probably worth noting that Noah, by choice, is keeping almost the entire Daily Show creative structure intact, from writers and producers to correspondents. But two painters can do remarkably different things with the same palette.